Top of kingsbury grade at summit village/ heavenly ski area. 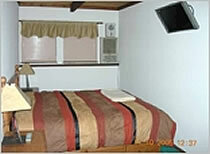 One bedroom unit with a king bed, there are also two pull out sleeper sofas. Other bathroom information: There are two bathrooms, one full bath with a tub and shwer on the entry floor level and one bath/shower in master suite down stairs. Other amenities not listed above: The coin laundry is within the building complex so no need to go outside. There is a public sauna located just outside of the unit. The bus stops every 20 minutes just outside your door to take you to the ski areas or to the casinos. Other activities/entertainment: Conveniently located to lake tahoe and many ski lifts. Casinos, local bar, and pub are just a few minutes away. If you reserve before October 15th save $100.00 per month on a month to month rental. This special is avaliable from December thru March only.